NOVEMBER 14 PUBLIC TRANSPORTATION OPEN HOUSE Please join the City of La Crosse Muncipal Transit Utility (MTU) for an evening of information, tours, free bus rides, and a celebration of Public Transportation! 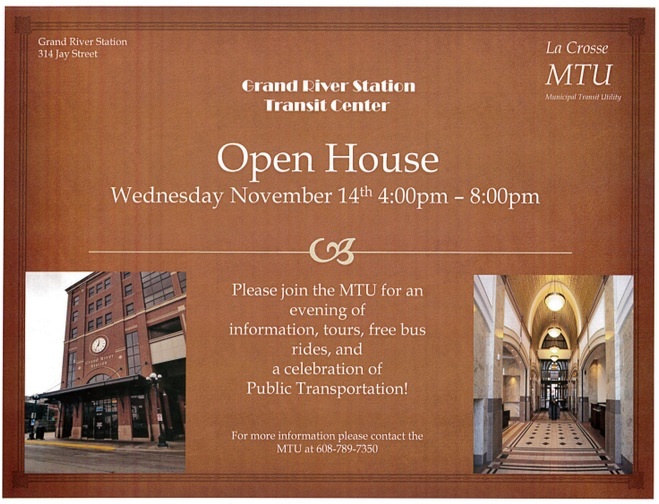 The OPEN HOUSE will be held on Wednesday, November 14 from 4 to 8 p.m. at the Transit Center, 314 Jay Street. Please call 608-789-7350 with questions. If you are already a bus rider, here is your chance to demonstrate support not just for what we have now but for a robust, well supported, and interconnected system going forward. If you aren't a bus rider yet, here's an opportunity to learn more about the system and how you can benefit. The private vehicle is a household’s largest contributor to greenhouse gases. By taking existing public transportation instead of driving a car, an individual can reduce annual carbon emissions by an average of 4,800 pounds, (tinyurl.com/apta-businfo), A strong public transportation system is good for the environment. In addition, public transportation serves all people, regardless of age, income or ability. Riding the bus is safer than driving. Riding the bus saves most commuters money. There are major economic values for communities with strong public transportarion systems. Converting to electric buses can not only improve communities' air quality and carbon footprints, it can save them big money, too. And, as noted by Enrique Peñalosa, the former mayor of Bogotá, Columbia, public transportation is democracy in action. A developed country is not a place where the poor have cars. It’s where the rich use public transport.